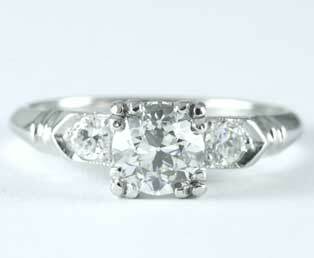 Clean, traditional design lines flatter 3/4 carat European diamond in this estate engagement ring. Your eye is quickly drawn to the light reflecting from this center VVS2, Color I diamond. This center diamond is held by four strong, split prongs. Framing the center diamond, are two smaller equally dazzling European diamonds. This classic platinum engagement ring is timeless. Old European diamonds were the most popular cut diamond between 1900 to 1920. This diamond cut was the transitional cut between old-mine cut diamonds and today's brilliant cut diamond. They are often confused for old-mine cut diamonds because of their high crown. Their fewer facets create a broader span of light reflection. It is a special treat to find a old European cut diamond weighing appx 3/4 carat with a VVS2 quality. Unlike today's diamonds, lasers were not used to remove carbon or other diamond flaws.